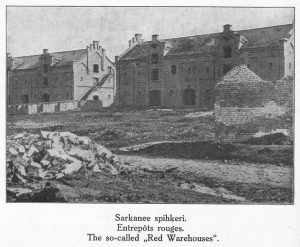 Warehouses or so-called Warehouse district between present Maskavas, Turgeņeva and Krasta Street until the liquidation of Riga fortress (from 1857 to 1863) was located outside the ramparts of the fortress and was known as Lastadija – that in German means cargo loading and unloading place. First time Lastadija was mentioned in historical materials in 1348. Initially boatmen, raftsmen, merchants, peasants that run away from their serf-owners lived in Lastadija and built here their huts. In the swampy lowlands, along the main road that led to the East, the first barns, warehouses and pubs began to appear. Timber-yards also located in Lastadija. Here after floating trees have been pulled ashore, a writer or any sorter counted them and then gathered for drying. Trees have been left in yards or floated farther on the ships. Also in the 15th century timber-yards located in the city or its vicinity, and they belonged to individuals. In 1599, eight timber-yards have been mentioned; some timber-yards located in Lastadija. The first legal building in Lastadija formed only after 1582, allowing build only wooden houses and at sufficient distance from the city walls and ramparts. These rules were valid until the liquidation of the fortress in the middle of the 19th century. Mills, barns, warehouses, workshops, residential buildings, merchants` farms, pubs, schools and churches have been built here. Exports of goods from the East to the West through Riga have played a significant role. 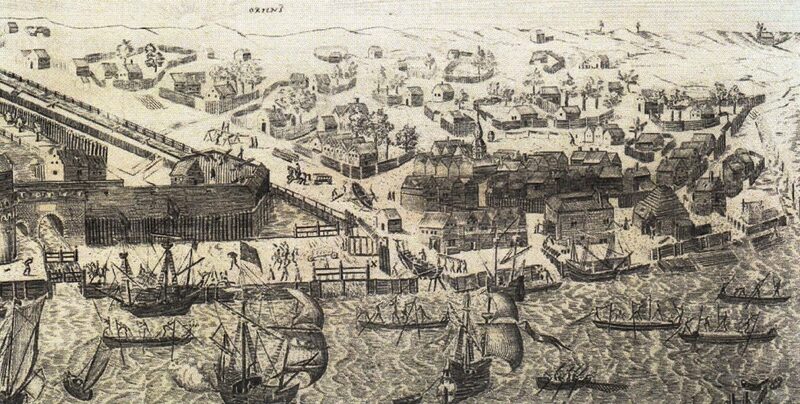 Exports of such goods – grain, hemp, flax, and mast trees, fat – dominated, but in the 18th century leaf tobacco, timber, sailcloth and other goods gained importance on exports. Demand for spars, barrel staves, flax and hemp necessary for ship rigging was promoted by the growth of ocean navigation as a result of the major geographical discoveries, as well as by direct sea wars. The principles of good sorting and weighing were strict in Riga and they gave high incomes to the city. For example, before the floating of timber on ships, it has been checked again, whether it is not damaged; by a purchaser’s request it has been squared (it was expensively, but gainfully for merchants, because it saved place on a ship and reduced custom fees); an inspector re-measured, sealed it again and issued a pass for loading onto a ship. City scales have been set in the marketplaces in Riga since the middle Ages; scales have to be used compulsory for weighing of goods for export. New scales placed in Lastadija became a special place, because it was not possible to re-weigh all goods, using Old scales placed on the Town Hall Square. In the 18th century, at Maskavas Street in Red Sheds quarter hemp scales located, but at the end of Kārļa Street general good scales located. At the end of the 19th century, the usage of public scales decreased gradually, making trade rules easier. Also in the first half of the 20th century, on the Daugava River banks near Red Shed, Kārļa wall scales located near Kārļa Gates. At the end of the 18th century and at the beginning of the 19th century, three main development directions of the right bank of Riga have appeared for the first time – Ganību dambis, Brīvības Street and Maskavas Street – that have been staying up to nowadays. Vacant areas between these building directions continued to operate as urban grasslands and meadows. Building of Warehouse district in present area of Riga Central Market mostly developed in the 1860-1880 (the 19th century) after the liquidation of Riga fortress. Then the centre of Riga has been re-built according to city planning based on the project developed in 1856 by Riga city architect Johan Daniel Felsko (1813-1902) and the architect Otto Dice (1832-1890). According to this project the fortress moats to south-west from the Old Town should be transformed into the port basin, but in the territory to present Turgenev Street to build homogeneous form warehouses. In the district between Maskavas Street and present Krasta Street this project provided greenery. 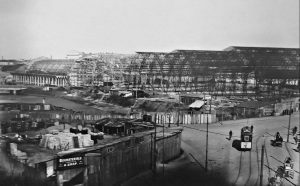 Government of Russian Tsar required re-developing this project because of its high costs. It has been done under the guidance of the architect Julius August von Hagen (1829-1909), and in 1858 this project has been approved. Warehouse Districts between present Gogoļa, Gaiziņa and Maskavas Street and Central Market are marked as „a place for commercial buildings”, but the territory between Maskavas Street and present Krasta Street is marked as built-up district, not showing the configuration of anticipated buildings. 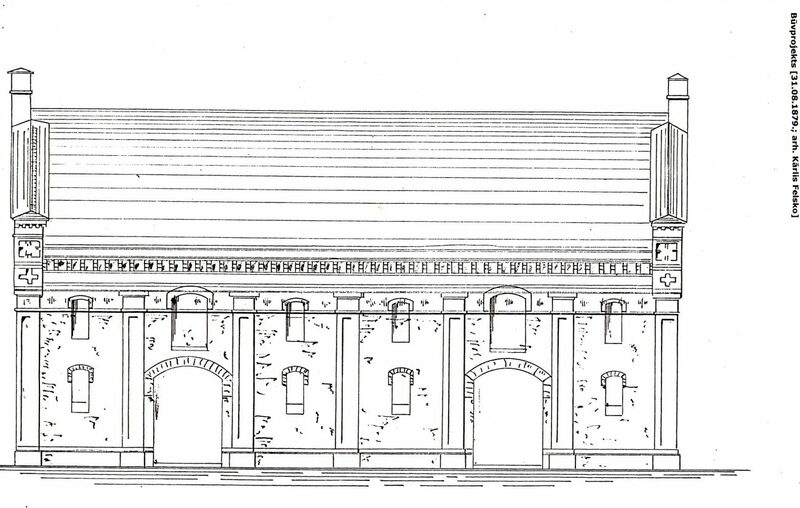 In 1865 Baltic Governor General Peter Shuvalov convened a commission that consisted of the city`s government delegates, representatives of Exchange committee and Riga – Dinaburga railway company with the task to consider the possibility to eliminate the construction of the expected and existing warehouses in warehouse or barn district on the banks of Daugava between present Gogoļa Street, Central Market, Krasta and Turgenev Street. 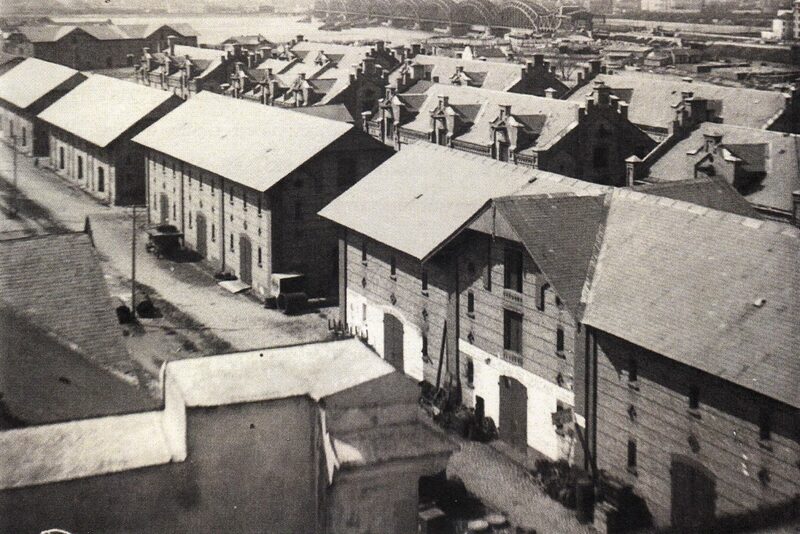 The final decision has been taken in 1869 when the Governor General approved the conditions of construction of warehouse district, which specified that warehouses should be built in accordance with unified plan – with mutually agreed facades of individual buildings that should be agreed between the invited architects. The first warehouse was built in 1864, but the latest in 1886, gradually replacing the previous wooden warehouses or barns that have been located here since 1812. In total 58 stone warehouses have been built. 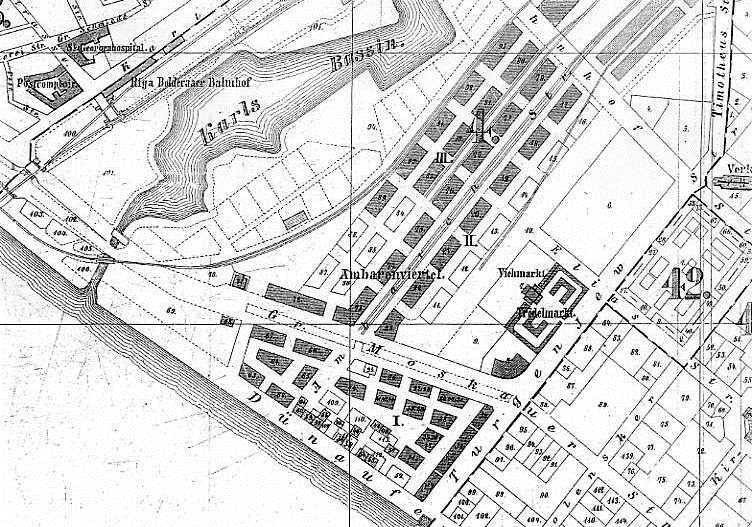 On Riga map in 1803, along the bank of the river warehouses are shown: potash, tobacco, wool, lime, hemp sheds, as well as other sheds for storage of different materials. 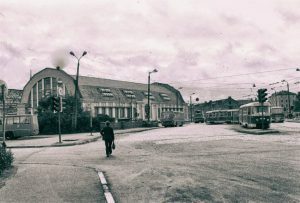 Warehouses were used for storage purposes for about a century, but their functional importance warehouses lost in 1903-1907, when in 1903, on the city`s grasslands near present Hanzas Street new goods station has been built and in 1907, on Andrey-island Riga – Krasta station has been open. Fate of warehouses has been decided totally with the construction of the market. Red Warehouses have been damaged in the period of Bermont. In the fragment of Riga plan, which shows the territory between railway line and Dzirnavu Street, places, in which Bermontian large shells fallen, are marked with black point. 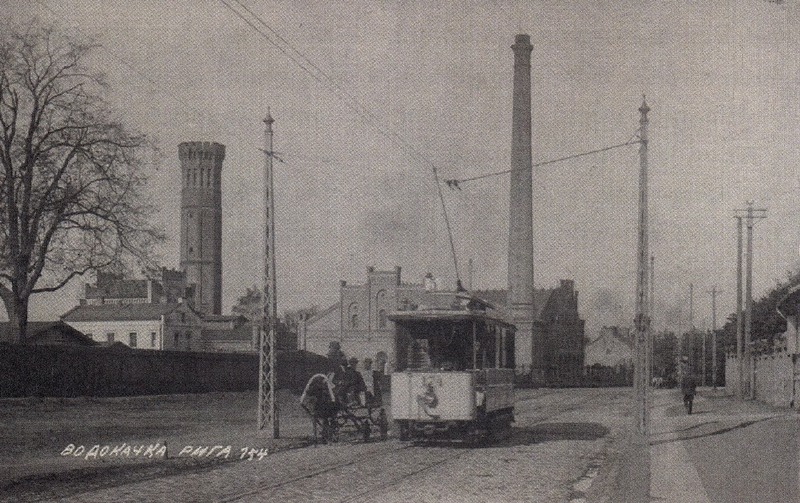 In the warehouse district, between Maskavas, Krasta and Turgeņeva Street, 11 places affected by shells are specified, but in total in the district between railway-line, Dzirnavu Street, Gogoļa Street and the River Daugava – 43 places. A part of Red Warehouse district has been liquidated in 1924 – 1930, during the construction of Riga Central Market; some warehouses have been re-built into residential buildings or have been demolished. Other warehouses have been used as hay, oats, linseeds and carpenter accessories shops, rope workshops, electric motor and agricultural machinery warehouses, grain warehouses, veneer warehouses, egg warehouses, etc. All warehouses, except the warehouse stretching along Turgeņeva Street at Maskavas Street 14A, are massive two-storey or three-storey brick buildings. The warehouse at Maskavas Street 14A is a one-storey building. Warehouses have arched basements and wooden coverings between floors. Warehouses form a spatially not completed, but monolithic ensemble of buildings. According to special building regulations elaborated for the warehouse district, all warehouses have matching facades, i.e. facades that have similar and harmoniously attuned design. They are designed in the so-called „brick style” – one of formal varieties of the 19th century eclectic style that prevailed in the architecture of industrial structures, warehouses and other commercial buildings. The artistic image of the buildings is determined by the rhythmical division of facades with pilasters and strong, figuratively built cornices. Bricks of two tones – sand-yellow and clay-red – were used. Pilasters, tabling and other plastic construction elements were made of red brick, as well as horizontal lines in the walls of yellow brick. Bricks of both tones are interchangeably laid also in archivolts of opening lintels. 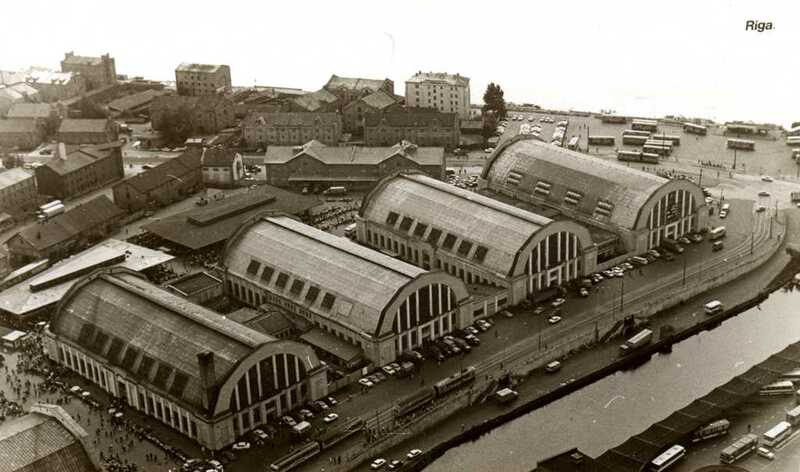 The artistic image of warehouses bears the individual artistic handwriting of each architect. The warehouses designed by R. Pflug in comparison with others have a more generalized monumental expression. The figurative brick masonry is accentuated only in jagged cornices that look like tabling. Horizontal lines of red brick in the facades are made of two rows of header bond with three layers of yellow brick between. The middle layer is made of rhythmically interchanging bricks of both tones. The eclectic buildings that are characteristic of K. Felsko stand out with their accentuated relief finish of the walls. The warehouses he has designed differ with more intense and sophisticated details. The pilasters separating the walls have tuscan-type capitals while under the cornices there are ornamentally laid tiles. Two warehouses designed by J. F. Baumanis are located in the inner space of the block and they are formal in shape. The only architectural elements are corners of the buildings that are accentuated with pilasters and smooth cornices. Three warehouses in the district were designed by R. Schmaeling. The one, which has been preserved, stands out with a very eloquent architectural finish. In addition shallow arches with accentuated archivolts, where the contrast is made by interchangeably laid bricks of two tones, are constructed in the upper part of facades under the protruding jagged cornice between rhythmically arranged pilasters. The footings of arches on the pilasters are accentuated with cross-shaped mouldings which replace capitals. The architecture of the building is slightly deformed due to primitive extensions.